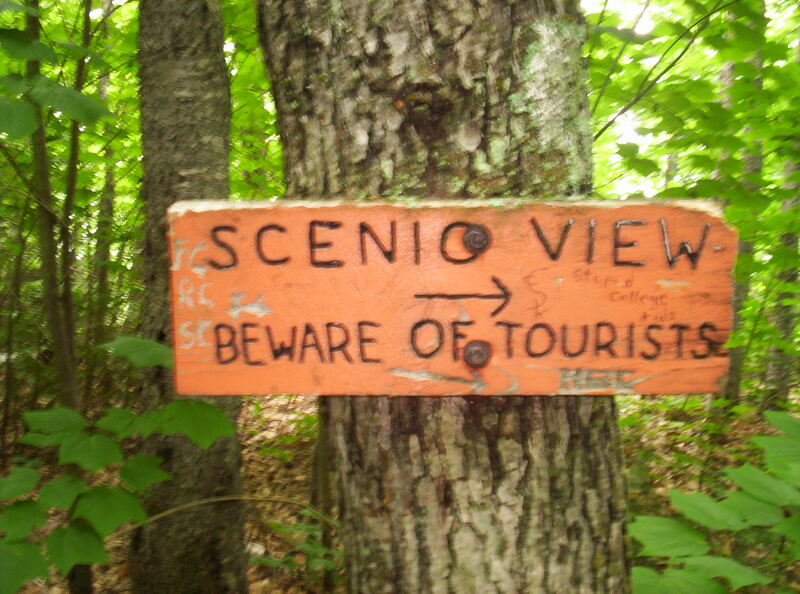 Glencliff, NH to Norwich, VT: Beware of Tourists! What’s not to love? You can’t possibly get any more concise without losing something doing so. A half gallon of Hershey’s ice cream (from Hershey Creamery Company, which astoundingly isn’t affiliated with the chocolate company, although I’d be surprised if most people eating the ice cream knew it) contains 16 servings, each with 140 calories, for 2240 calories total. I think it would be awesome if they collaborated with Mars and made a Milky Way ice cream, just for the sheer cognitive dissonance of it. I wake up fairly late and pack up my things. On my way out the hostel owner mentions two things. First, make sure to check out the “penta-style” (the Companion’s description, contrasted with the more normal “mouldering”- or “composting”-style privies) privy at Hexacuba Shelter (my intended target for the day). 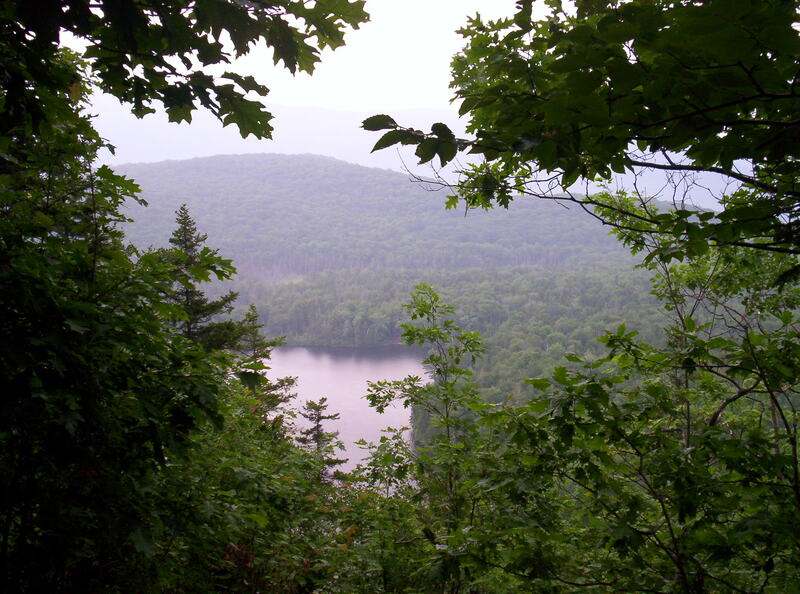 The second is that there’s a hiker festival in Bennington, VT on August 1 with free food, and when I say free I mean “free as in beer”, and if you think that phrase might have more than one meaning, it indeed does, and both apparently apply! 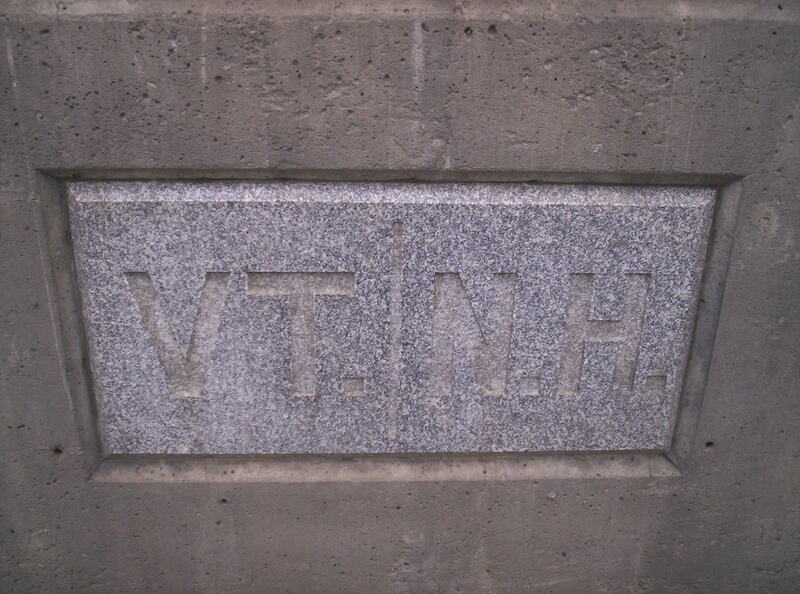 Bennington’s at 577.9 miles from Katahdin, so that’s perhaps 180 or so miles from where I am now. If I attend it’ll mean punting on recouping pace until August; for now I choose to punt a different decision — whether to attend — and see how the hiking goes between now and then. I’m supposedly on the hiker highway now and should be able to hike further and faster, but the delta is still a big unknown. After packing and heading out, I drop by the post office that’s just across the street and send off more gear I don’t want to carry any more: a hat I’ve only worn because I remember I’m carrying and haven’t worn it recently, pants (rain suit and/or fleece, can’t remember which), and one or two other things. 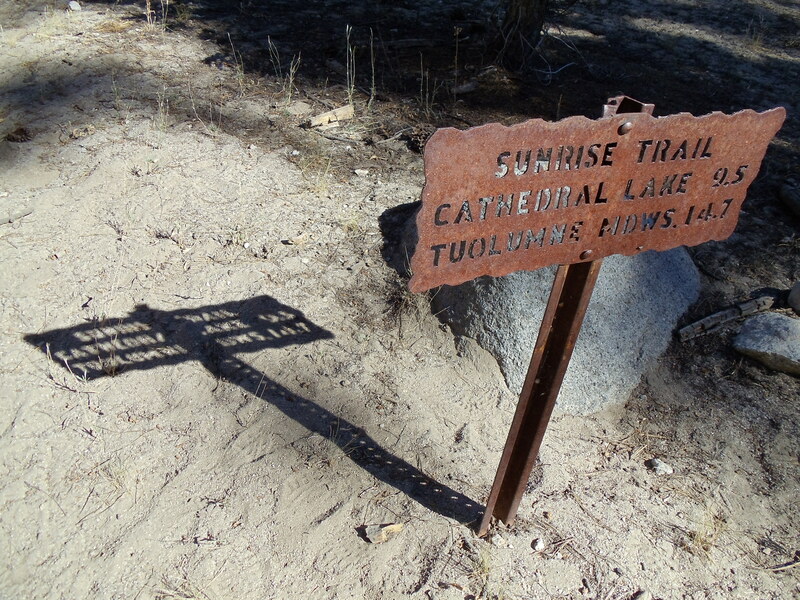 I stop by the nearby pay phone and call home for a bit, then it’s back on the trail at 12:28 for a day of hiking. I love these guys; the AMC (Appalachian Money Club, natch) felt moneygrubbing and impersonal, and MATC felt somewhat perfunctory in its duties (if reasonably well-performed, modulo the ability to construct switchbacks or bridges over large streams or boardwalks through swamps), but these guys feel like they enjoy what they’re doing. 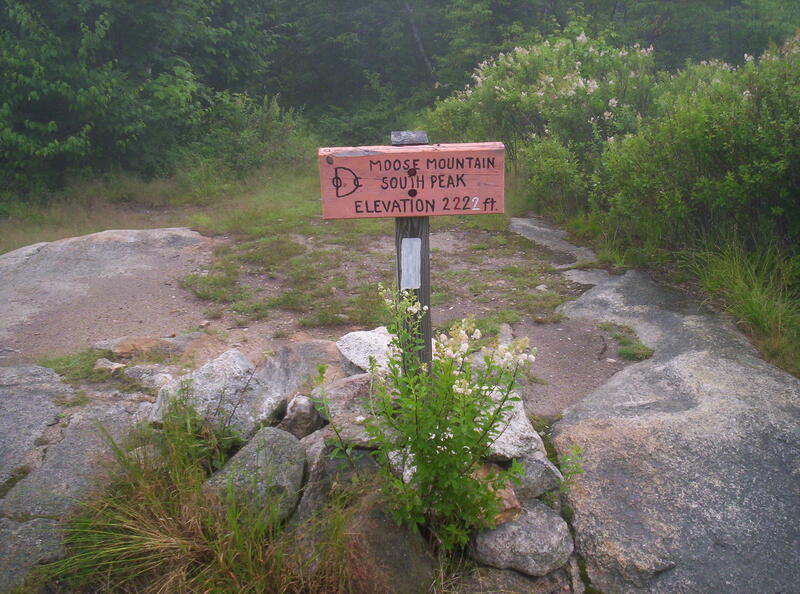 I’m not entirely surprised; one sign atop Moosilauke gave a mileage figure to the post office in Glencliff, a move clearly catering to the needs of thru-hikers, and trail junctions often point out A.T. north and south (a problem in the maze of twisty trails that was the Whites). While I’m at the overlook I meet another southbounder named Sweet Sweet, hiking from somewhere north of Glencliff that day. I head on while he stays longer at the overlook. I’m running pretty low on water when I get to the first shelter south of Glencliff, Ore Hill Shelter (the area’s actually a bit contaminated from the operations there in the past, with signs saying where not to stray to avoid problems), and I stop to fill at the puddle there. It really basically is a puddle, although it seems to be fed somehow. A frog jumps out of the pool when I fill up, and due to dehydration I wait the necessary twenty minutes at the shelter to have a liter to chug and promptly refill before heading out again. Going south, it’s awesome how easy the hiking is. Terrain’s mostly flat, no huge winds or tricky rocks to navigate — worst is a stretch of trail that I have to run through to avoid mosquitoes, really. I reach Mount Cube just as it’s getting dark and take a few shots of the sunset; if they’re anything like the pictures I’ve tried to take since, they’re not that great. This camera is about as bare-bones a digital camera as you can get: no zoom, no ability to deal with light and dark in the same picture (kiss super skyline shots goodbye), really inadequate all around. The camera’s original intended purpose was for purely indoor, close-range photography without a need for true detail (photographing completed Scrabble games at tournaments to avoid needing to exactly record moves, to be precise), so I shouldn’t be surprised it underperforms here. Just after the summit, on super-slick rocks where my poles are useless if they’re slanted any amount at all, Sweet Sweet catches up to me, and we walk the remaining couple miles to Hexacuba Shelter mostly in the dark with only my meager flashlight for assistance. I’d considered making dinner when I got in, but there are other people in the shelter and I’m tired anyway, so I go to sleep. I wake up fairly late by hiker standards and am able to take a first look at the shelter where I slept the past night. Every other shelter I’ve seen so far has been a variation on the three-sided theme with perhaps a second floor or a skylight for variety and some manner of support for cooking and eating. This shelter is just bizarre. Its base is a regular hexagon; four adjacent sides are walled, with the remaining two open for entry and exit. The roof is a hexagonal pyramid, with a central beam going to the top. The shelter floor is a few feet above the ground, so you can sit and let your feet dangle as you cook or do whatever. Of the shelters I’ve seen so far (future-me speaking, over 80% down the trail), it’s by far the most unusual. The privy (“penta-style”, if you recall) is standard fare but has a pentagonal base. As a reminder, this is all right next to Mount Cube. Have I said how much I enjoy the DOC’s trail maintenance yet? Today’s start is rather slow, and by the time I’ve eaten breakfast it’s raining; I take a look for the register and find a section of the seventh Harry Potter book in the shelter, and of course I’m sucked into it as I don’t really want to hike in the rain. The section is from Malfoy Manor to the first page inside Hogsmeade, some fun reading. About 10:30 or so I finish and reluctantly head out into the water. I’d originally hoped to get to Moose Mountain Shelter today, around 18 miles south, but the late start and the rain slowly nix that idea. I stop for lunch at the Firewarden’s Cabin about five south, eating on a porch out of the rain. I also fill up water bottles; there’s a trail to a source, but it’s so rainy and wet that I only get perhaps halfway there when I have to walk over several large puddles. Rather than do that, I just scoop the water out of the puddles with my bottles — with my water purification system (iodine crystals which diffuse into a glass bottle of water, then add the resulting solution to impure water and wait twenty minutes), I don’t need to worry about filtering or wasting my time in the rain. I’d highly recommend Polar-PUR iodine for anyone considering water purification systems; one bottle’s something under $20 and will last for years (I doubt I’ve used half the crystals in mine over four months of hiking). There is the matter of the taste, but if you can get over that the stuff’s awesome. It continues raining as I head further south, but I now have a goal in mind. It turns out there’s a guy slightly off the trail south of here who gives ice cream bars to hikers when he’s home! You can also fill up water bottles from a hose, so much nicer than drinking water with iodine in it. 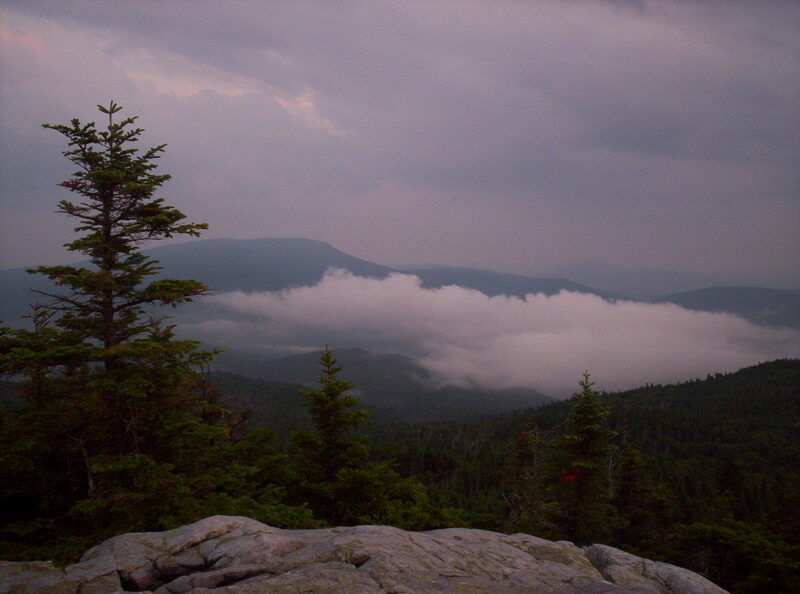 It’s stopped raining by the time I reach the hundred-foot side trail to his house; I don’t see anyone home, but as I fill up my water bottles the man walks up from a short hike up the mountain to the south. He gets me an ice cream bar and asks a series of questions: trail name, home town, age, what sort of hike (thru, section, day, etc.) I’m doing. He says he’s been recording this information for several years now; for several years now, the median age of hikers who stop by is 26. He also mentions that it rained around three inches today — yikes! 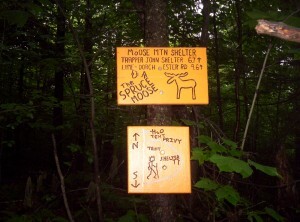 It’s getting to be late afternoon now, so I continue south just another mile to Trapper John Shelter. 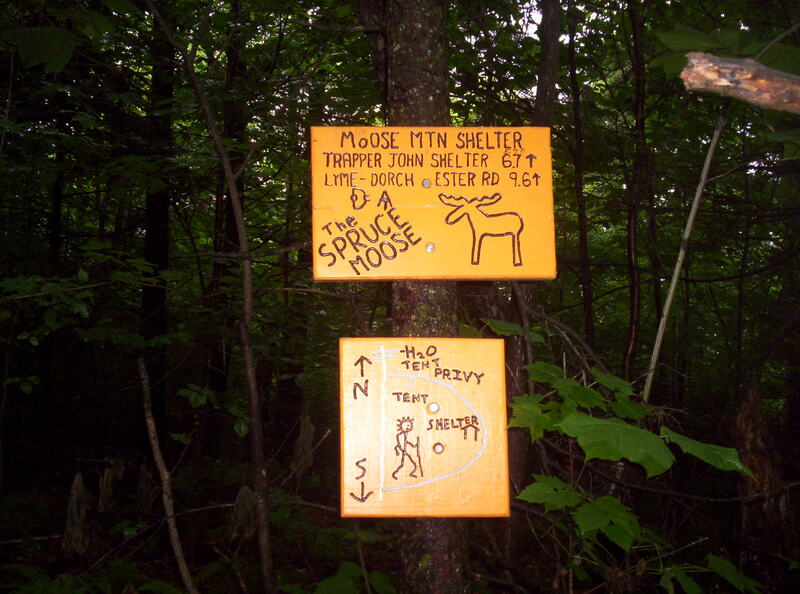 I end up spending the night at Trapper John Shelter with four companions. Milkshake and Monty are a Dartmouth graduate and her dog, out for a backpacking trip during the summer when classes aren’t in session (she’s a teacher). The other two are Pickle and Ragdy Andy, two northbound brothers who, as I discover further south on the trail, hail from Israel. The shelter’s nice and comfy for the night, and I head to sleep planning to reach Hanover and Dartmouth or thereabouts tomorrow. Typically I compile these entries by looking over the list of trail features in the Companion to jog my memory, then add anything I remember from those features. As I look back at the schedule today, I really don’t remember much of anything. I stopped at the first shelter south, Moose Mountain Shelter, and spent some time reading some printouts of A.T. history, while eating lunch. I also believe I noticed an entry in the register from Frog, a northbounder I met in the spring (at the same time I met Chef) during my little loop over spring break; it seems I’ve missed seeing him, alas. It’s getting close to six or so by the time I reach Velvet Rocks Shelter, just 0.8 miles north of Hanover. 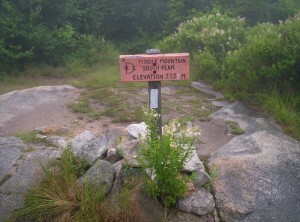 Most people don’t stop here; Hanover’s close, and I hear several fraternities offer space for thru-hikers to stay. It’s late enough, however, that I don’t feel like taking my chances on finding a cheap spot in town, and in any case, this shelter’s awesome! It has a clear plastic roof, and the register is full of entries from people talking about sitting in sleeping bags overnight watching bats fly overhead. I get water after a considerable walk to the source north of the shelter (off the A.T.), eat and head to sleep. I take it nice and easy this morning, as I intend to take a slow day through Hanover. After breakfast and signing the register (populated primarily with Dartmouth student entries — I make a pitch to them to not start work immediately after graduating to take advantage of college loan deferments and the largest block of free time and physical fitness they might ever have again), I head into town. Next stop is the library, where I work some on updates here and start to record mileages each day in drafts so I can see how far off pace I am. Conveniently the computers aren’t in demand, or else I’d have had much less time to use one than I did. I linger inside for awhile before returning to the heat outside to finish off the cherries and bread. The pack cover I’ve been using so far, which I’ve had since my first backpack as I recall, is pretty horrid. 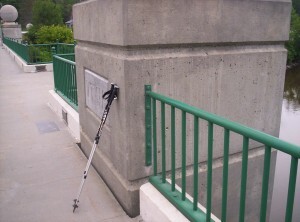 I’m not really sure it even works at all, and its form was designed for an external-frame pack (a very rare sight on the trail these days; strange how much that’s changed in the last ten years or so). The first outfitter in town has none, so they direct me to another. This one has pack covers, but strangely enough the smallest one they have is too big for my pack, which is itself far bigger than it need be for hiking the A.T. (once I removed the superfluous gear, that is). I depart pack-cover-less and head for an unplanned stop at Ramunto’s, a pizza place down the street. 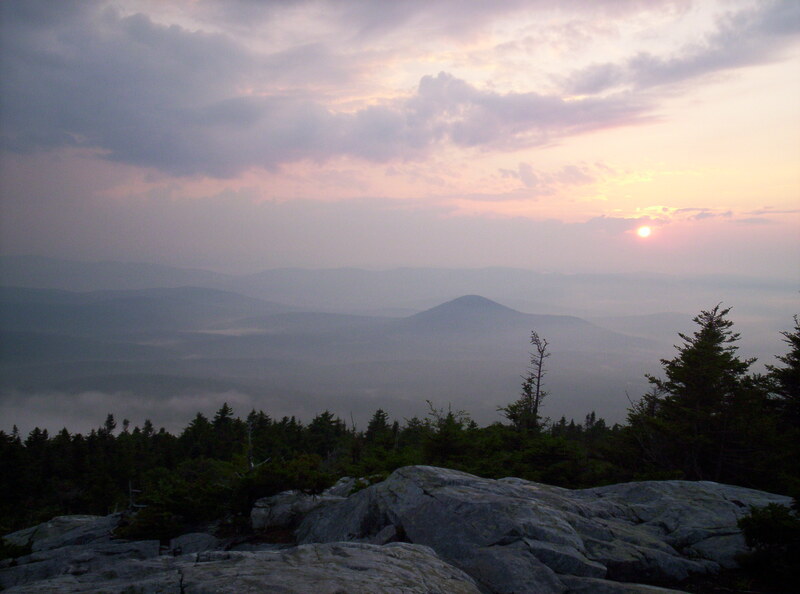 Word on the street is that they give a free slice of za to thru-hikers! I arrive, partake (along with a draft Guinness, partly because it Is Good and partly because it’ll help offset the cost of their generosity), and sign their register. The last stop in town is for a much-needed haircut, the first since Christmastime. Ideally I’d have gotten the haircut in Boston, but I couldn’t find time while there. I suspect that that saves me at least a pound of weight to haul over trails when my hair is wet. Finally, I head out of town, briefly stopping at the DOC offices to see who’s there (nobody) on the way out. Now follows one of the less enjoyable parts of the trail: a road walk. 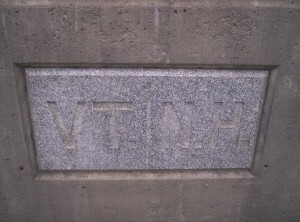 I stroll a couple miles or so down sidewalks and across the bridge over the river defining the New Hampshire-Vermont border into Norwich. From there it’s a run down a side street, past a house with a table out front with a handwritten sign reading “trail magic” (and a dog who seemed curiously incapable of dragging himself to me to be petted, until I realized the high-pitched whine I was hearing from his collar was a radio restraint device; once I moved toward him so he could retreat a bit he was markedly more mobile), and up a hill to a return to wooded trails. The trail’s slow going at first; packs weighted with resupply are too heavy. To tell the truth, tho, I bring some of this upon myself by carrying a couple pounds of Granny Smiths. (Carrying apples with me out of resupply, sometimes for multiple days, is a foible I have not managed to curb. I’ve been told by some I’m the least weight-conscious southbounder they’ve met; if that’s not actually the truth, it’s certainly not far off.) Eating a couple for energy and “weight loss” (off my back, even if not from what I’m hauling) helps, and I walk into Happy Hill Shelter at dusk, cook dinner, and sleep. The future-me speaking now is a mere 270 or so miles from the end of the trail, as of yesterday at -1.7 from pace at 1903.3 down the trail in Hot Springs, NC. The last week or so I’ve passed through North Carolinessee, as the trail practically follows the TN–NC border for awhile. I have roughly 40 miles to the Smokies, 70 miles through them, 80 miles through North Carolina not along the border, and then another 80 miles through Georgia to Springer Mountain. I’m still not sure what day I’ll be done — I’d kind of like to be home by next Saturday, but that’s probably overly ambitious. In any case I can smell the end, and I’m starting to drag a bit as I fight the urge to stop just a little bit earlier each day, wake up a little bit later (daylight’s disappearing, alas) and not leave a warm sleeping bag for the creeping cold, stay an extra night in towns, and on very very rare occasions flat-out skip trail by hitching from the trail ahead to a town where I might have planned to stay (exacerbated by late-day hiking caused by the late wakeup, of course; night hiking is curiously both tedious and fun at once). I have not yet succumbed to these temptations — I’ve been working at not zeroing since my last one in Damascus, just north into Virginia — and I’m into the last push to finish. I’m definitely looking forward to being done hiking soon. I’ve got a fever, and the only prescription is more cowbellSpringer!